Over 2000 kilometres of roads and trails lead through mountains, picturesque towns and villages, pine forests and coastline. When can you travel there? Actually, all year long - it's always good to visit Canary Islands, because the weather there is rather stable and temperature is pleasant, even in winter. We went to Gran Canaria at the end of February, to escape from dragging winter and unbearable smog in Poland . It's very satisfying, almost unreal experience, to get away from freezing cold and dark days to warm and sunny paradise. Amazing weather guarantees unforgettable views during mountain hikes. Because of the climate, specific landform and diversity of vegetation Gran Canaria is often called mini continent . I couldn't agree more. In Gran Canaria we will find charming old towns, sandy beaches and dunes, beautiful botanical gardens (the most popular one is in Las Palmas ), volcanic craters, plantations of exotic fruits and coffee. It's also the only Canary Island in which caves there still live native aborigines. But it's the mountains which are the biggest magnet for me , the raw volcanic mountains which are so different than our continental mounts. So, let's have a look at my subjective list of the most interesting hiking trails in Gran Canaria. It's one of the most popular places in Gran Canaria. It's as important for Canariones as Teide volcano in Tenerife. It used to be a cult place for the aboriginal inhabitants. Nowadays, the island's anthem starts with mentioning Roque Nublo, writers create poems about it, it's popular element in patriotic songs and lovers come there to spend their dates. When in 2010 island's government proposed to build a chairlift from nearby village to the rock, Roque Nublo enthusiasts started to vigorously protest. This 80-metre high basalt rock is located on 1813 metres . It's considered the most beautiful natural monument in Parque Rural del Nublo. It's also the highest volcanic rock in the world, and a great example of the fact that volcanic eruptions wreak havoc, but can also create natural wonders. The easiest way to get to Roque Nublo is by car, traveling on road GC-60 which leads to Ayacata village, where we turn to road GC-600 . After 3 kilometres there's parking space signed "Roque Nublo". To be sure there's space available it's best to arrive early in the morning. There's nice and easy hiking trail leading to the monolith. It's 1.2 kilometres long, and getting to the monument takes about 30 minutes of relaxed walking. If this short walk isn't enough for you, you can continue hiking to Barranco de Tejeda gorge. Then, only 1 hour more and you're at Roque Bentayga - another breathtaking volcanic formation. Breathtaking caldera located close to the island's capital Las Palmas de Gran Canaria. It's nice and easy option both for experienced hikers, as well as families with children. In fact, every nature aficionado will find this trail amazing ! Abundant greenery and interesting landforms create beautiful scenery! This circular hike will take about two and a half hours and will provide you with breathtaking landscape of 1000-metres wide volcanic hollow. It's great option if you only have a couple of hours - this trail is only 3 kilometres long. The easiest way to get to Caldera de Bandama is to go on road GC-4 , then in a village Monte Lentiscal turn to road GC-802 . There's parking space in Bandama village, but it's not very big, so, as always, it's best to get there early in the morning to avoid crowds. You can also reach the caldera by 311 bus line from Las Palmas or San Brigida. There is one bus every hour. You can plan your trip here . It starts near Presa de Chira dam . This amazing path leads through pine forests to Presa de las Niñas dam . It's best to reserve whole day to hike it. It's about 8 kilometres long but it takes about 5 hours to hike it - the terrain is hilly. At some point the path isn't clearly marked, so it's necessary to pay attention to the trail. This picturesque trail isn't very popular among tourists, so the added bonus here is no crowds. 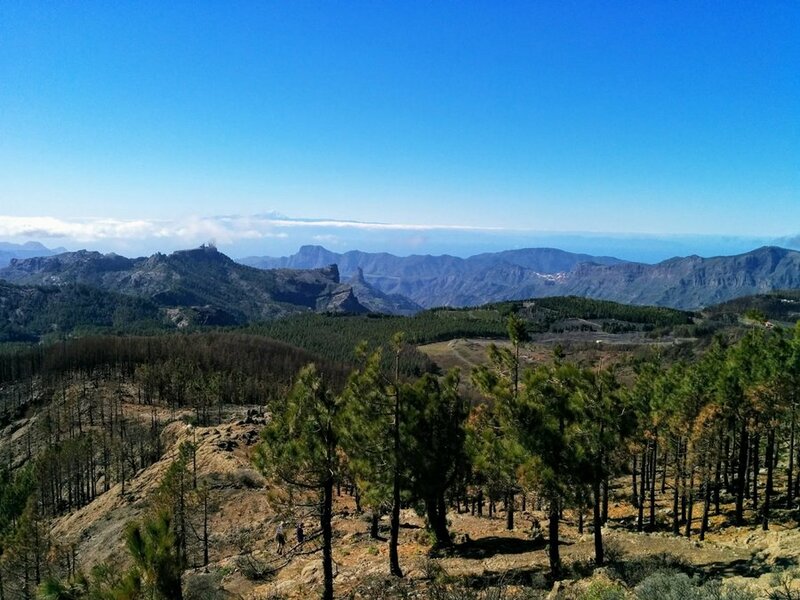 It's located in Pilancones Natural Park , which for me is one of the most beautiful natural areas in Gran Canaria. It's best to get there by car, traveling along road GC-60 , then turning to GC-604 . When hiking in the mountains, it's always good to have sunscreen, windproof clothes and hiking boots. Even if there's 30 degrees on the coastline, it may be chilly and windy up in the mountains. We stayed in Maspalomas in the south of the island. The location is very convenient both for inland trips and beach relax, but it was too noisy and crowded for us. Next time we visit Canary Islands, we will definitely choose some peaceful place in the mountains, far from popular tourist resorts. Och, and one more thing - when traveling to Gran Canaria, make sure you try typical Canarian dish called ropa vieja . In America it's known as a Cuban dish, but it’s actually a byproduct of Canarian emigration to Cuba in the 18 th and 19 th century. It's delicious!